Cosmic-wolfz has started a donation pool! 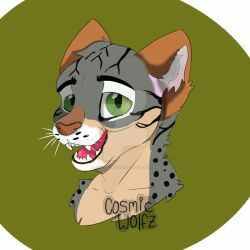 want to support my art? Leave a little donation! 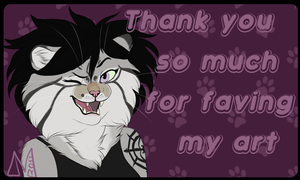 I sometimes do free requests that take time out of my other art, so I really appreciate every little bit! It's ya boy, Cosmic Wolfz. 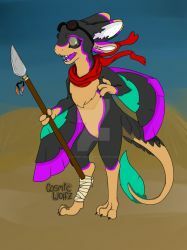 This is where I try to post all my art. I'm always open for commissions so just hit me up if you want one. I'm an artist of many sorts, as well as Fursuiter. You can find me on any social media as "Cosmic_wolfz" or some variant of that. If you like what I do, consider buying me a coffee. Favorite visual artist Challa, Fuudles Favorite movies Suicide Room, Corpse Bride, The Boy and The Beast, Horns. Favorite TV shows Black Butler, Death Note, Stranger Things, magic fun house. Favorite bands / musical artists Mother Mother, A Giant Dog, My Chemical Romance, Elias and The Error, Hamilton. Favorite books The wolves of the beyond series. Favorite games Pokemon, Fallout, Skyrim, Fable, Corpse party Favorite gaming platform PC & Xbox Tools of the Trade Wacom Tablet, pencil, Copic markers. Other Interests Fursuit making, Writing, Youtube. Personality: logical, aggressive, cold, liar. likes: Music, energy drinks, horror, disobedience, vapes. Dislikes: Hate, Authority, grapes, not having control. optional: piercings. 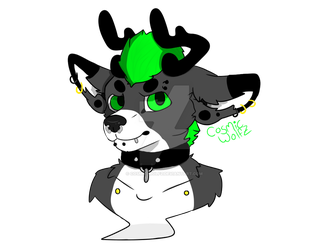 add any you want when drawing him! I'm not on DA as much as I'd like, so if you'd like to reach me faster you can send a quote (directly from the 'shop' tab, scroll to the bottom of the page) to email me and ask about how much your custom suit would cost. OR message me from my social medias! 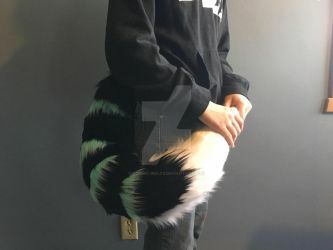 AHHHHH LOOK AT THIS TAIL I MADE! This is a logo I drew for my fursuit company, Hybrid Hexes! You can find us on Instagram as hybrid_Hexes, and thats all the social media i've made for it currently. Give me a follow if you like my stuff!!! Aw, Thank you! and no problem!